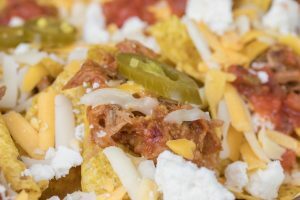 STADIUM STYLE PORK NACHOS – with VIDEO – Chandler Foods Inc.
Heat the CHANDLER PULLED Pork in the taco sauce and drain. Place half the chips on a baking sheet and cover with half of the pork. Sprinkle with half the queso fresco, salsa and jala- penos. Drizzle with half the cheese sauce. Repeat this procedure to add another layer. Place in a 300 degree oven until warm. Remove from the oven and slide the nachos into a 1⁄2 lb. food tray. Serve immediately.